Click on a topic to visit the recommended websites and find pictures to download from this book. An exciting and fabulously illustrated look at the lives of lions, tigers and other big cats. Describes how big cats move, hunt and find a mate, how they communicate and why they can see so well in the dark, and why some species are under threat. 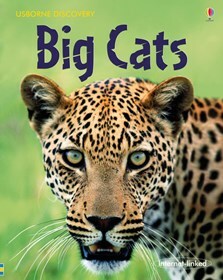 Fabulously illustrated with photographs of snow leopards, lions on African grasslands and jaguars in the Amazon rainforest. With internet links to recommended websites with sounds, animation and video clips.